At CSI, we are acutely aware that our success as a data supplier is closely linked to the success of our customers in the financial markets. We know this because the single most common reason that customers cite for leaving our service is poor investment returns. Although CSI customers include many commercial database companies, several universities, financial institutions, exporters, website dot coms (such as YAHOO! and Microsoft Network) and brokerage firms, the lion's share of our subscribers are individual investors. Virtually all of our customers are affected by the ebb and flow of the markets in some way, but individual traders are the most vulnerable to unfavorable market fluctuations. This month's message is intended to help traders invest with confidence and avoid costly mistakes. We have a vested interest in your success! Upon opening a brokerage account, every trader is asked to sign a waiver acknowledging that investing involves substantial risk. If this is true (and you know it is), why do industry publications leave you with the impression that virtually any trading approach will deliver regular profits? You can check the fine-print disclaimers for more realistic evaluations of risk, but how can you know if a trading system will really work for you? CSI's Trading System Performance Evaluator (TSPE) can answer that question better than any magazine article or advertisement. It allows you to find out your odds of success before investing your precious capital. This is a tool no trader should be without. TSPE, which is now part of Unfair Advantage (UA), is an innovative tool that certifies proposed trading methods and systems. It can help you know, in advance of investing your own money, if a given trading approach has substantial merit. TSPE was engineered to help traders avoid market losses by discouraging inappropriate trading schemes. Regular use of TSPE fosters prudent trading activity that balances risk against rewards and helps traders avoid using an approach that is likely to fail to return profits. We went to considerable lengths many years ago to produce this software, with the aim of helping traders hold onto their money. It continues to perform that function for those who choose to use it. TSPE is Monte Carlo simulation, so called because of the random nature of casino betting. It is actually a mathematical procedure that depends upon the use of random number generation to randomly mix the outcomes of events. This software randomizes trader-supplied profits and losses over time and then forecasts the probability of reaching a goal through the application of various levels of capital funding. The main purpose of the P&L randomization process is to remove any convenient grouping of profits interspersed with losses that may force an outcome to exhibit accidental success. For example, a very large initial profit followed by many smaller losses may not seem serious because out-of-pocket losses are absorbed by the earlier gain. If the situation were reversed, you may not have the courage to wait for that large gain to materialize. Randomization is, indeed, an important requirement of any proving exercise. Before getting started with an explanation of this exciting subject, let me say that there is absolutely nothing random about a digital computer. There are, however, mathematical procedures one might employ to create pseudo random numbers that are acceptable to produce a required level of randomness in a procedure. One can easily structure a Monte Carlo simulation from information derived from either actual experience or simulated trading activity, so long as the input data reflects the specific trading system you are testing. I have used the Monte Carlo approach many times in my earlier work as a systems analyst at the General Electric Company. My job was to help design defensive military systems and to prove them within the confines of a computer, before huge expenditures were committed to the engineering and development phase of a project. The U.S. defense community often employed such an approach in the design of radar or sonar systems. I imagine similar practices are still used to test the many elements of complex modern weapon systems. With TSPE, your computer becomes a virtual laboratory from which to perform the simulation task. We now have a way to engage your computer to solve a problem that asks whether or not you can prevail in the markets. All that TSPE requires is a list of the profits and losses produced in simulation or in actual trading for the trading system you want to evaluate, plus a count of the statistical control parameters used to derive that sample. The quantity of profit-and-loss data points should be 30 or more to capture an adequate random sample of possible outcomes. The number 30 is often required in scientific studies for reasons of statistical confidence and its implied conformance to distributional normality. In the recommended procedure, simulated profits and losses are subject to correction by the software, and they are affected by the number of degrees of freedom taken through parametric control. TSPE makes such corrections, and factors into the process the control liberties imposed to achieve the performance reported. Admittedly, these conditions may seem complex, but in the design of a defendable experiment, one must accurately assess the repeatability of the process and the biases inherent in the input. Furthermore there may be the temptation to overcontrol the process that leads to a particular result. TSPE will back out some of that excessive control by degrading the sample input. We are, after all, trying to prove that a given method will actually work in practice with real dollars. In the course of a simulation, all event outcomes (profits or losses) are randomly selected from the input list of samples. All trades are considered to be independent with no possibility for serial correlation. TSPE simulates trading your account by repeatedly searching for the eventual achievement of your stated dollar goal before spending ALL of your capital. It adopts a "sampling with replacement" protocol when randomly selecting from the supplied P&L list. This means that a given entry in the list has an equal chance of being drawn each time a new trade is randomly selected and processed. When the simulation is complete, TSPE will report the profit potential suggested by your sample input. The random circumstances uncovered by TSPE will balance your goal against a range of funding levels, and report the degree of assurance that committing funds to the market will return a profitable result. TSPE conveniently shows you a graph of three curves, all of which depend upon the capital stake you bring to the market. Not coincidentally, these are the facts you will need before you decide to begin trading. This TSPE chart shows that the trading system represented by the profits and losses provided would need to be funded with a minimum capital stake of about $10,400 to achieve about a 58% probability of reaching the $5,000 goal and about a 65% probability of preserving investment capital. This system requires a capital stake of about $10,450 to achieve a 99% probability of avoiding bankruptcy. The inverse probabilities are represented by the right-hand scale. 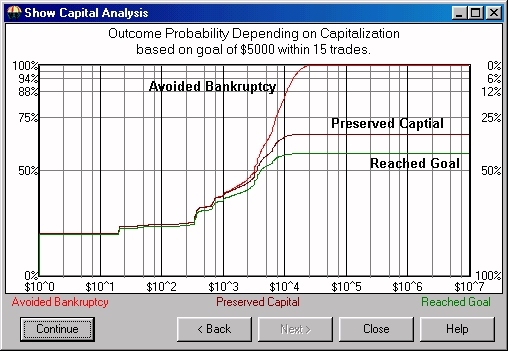 The vertical scale at the left in the display (see example above, at right) illustrates your bankruptcy risk, your chances of preserving your capital, and your chances of reaching your goal as a function of the capital you might advance (the horizontal scale) to fund your trading system. These curves are color coded in the display, but they have been annotated in this example. Not shown is the table of profits and losses that was supplied as input to the simulation exercise. Naturally, that table bears heavily on the results. Those profits and losses represent the principal evidence that describes the performance of your system. TSPE uses that key input to make its assessment. Many systems that appear to be vastly profitable may score poorly with TSPE because the random trade selection process could easily visit a string of losses that would exhaust your capital stake. It is a major objective of TSPE to statistically reveal systems that are subject to such flaws. Another reason for an unprofitable outcome from a TSPE evaluation that does not necessarily reflect upon the system itself is an unrealistic goal. If you find that TSPE does not report the results you expected, consider lowering your dollar goal to improve the results. 1) Can I afford the investment? 2) Is the return commensurate with the risk? 3) Can I tolerate the waiting time suggested by the number of trades required to achieve a given goal as presented by TSPE's display? To summarize, TSPE randomizes the input and looks for the stated goal achievement before your capital stake is consumed. A given run will explore hundreds, perhaps thousands of combinations of opportunities seeking goal achievement as it keeps tabs on the probability of bankruptcy and capital preservation. The given range of capital stake possibilities is selected by TSPE because it includes funding levels with a very low probability of reaching bankruptcy. Depending upon the integrity of the trading system and the appropriateness of the goal, it may or may not show a reasonable probability of reaching your goal. The capitalization range is provided so that you can objectively decide how much capital you want to risk, given the bankruptcy and capital preservation probabilities shown. It is important to note that TSPE will only evaluate systematic trading approaches that use consistent algorithms to generate trading signals. Such systems can be designed by UA users through the use of the MarketScanner or even the Advanced Studies feature of UA's charting module. Trading results from other analysis systems can also be run through TSPE. If you have bought or are contemplating purchasing a trading system, the developer may be able to assist you with the input string of profits and losses the system has produced for others. Ask the software vendor if he or she can supply such a record as evidence of potential achievement. You might also ask for additional input concerning parameter control, so that you can accommodate all of TSPE's input requirements. I remember seeing a similar tool to TSPE advertised by a software firm for around $15,000. We believe that TSPE is far better than that product, but there is no charge for TSPE if you are a CSI subscriber using UA. TSPE is FREE and will continue to be free to UA customers because we know that through this tool, you may be helped to avoid unprofitable trading methods. We urge customers to regularly make use of TSPE for the simple reason that we want you to remain solvent and sustain profitable performance throughout your trading career. Good luck, happy trading, and please, consult TSPE before taking on the markets. We're still fine-tuning the workings of Position Manager, but have it almost ready for release. This remarkable program will accept intraday quotes collected from third-party stock and futures websites, and then calculate your running portfolio value within UA. The special features of this software are 1) it employs a user-controlled interface to retrieve free intraday stock and futures quotes from available resources on the web, 2) it can take input in any currency and create output in any currency, and 3) it can combine equity values for commodities, stocks and funds in a single portfolio listing. As you know, CSI is not an intraday quote provider, nor do we claim to be. This software directs your web browser to the unrestricted sites of Yahoo! and INO.com for intraday data. Upon reaching these third-party websites, you'll see the automated process of Position Manager requesting the issues and contracts in your portfolio. Then you'll execute the requests by pressing "Enter" for each symbol. The actual data retrieval process is just as it would be if you had navigated to these sites and entered the prompts yourself, except that UA enters the symbols for you and remembers the responses. You'll have the opportunity to partake of these websites' other services and view their ads on each visit. We remind you that the data from these websites is copyrighted. It is your responsibility to read and abide by the copyright notice for each site. Please check the CSI website at www.csidata.com/UA/uax.html for information on the release of UA version 2.5.2, which will include the Position Manager upgrade. The quotes received by Position Manager are not stored in your resident copy of the CSI database, so they will have no impact on the charts created by UA. We reserve the right to use the end-of-day quotes provided by CSI in Position Manager's portfolio valuations in the event that intraday stock and/or futures quotes from third-party sources become unavailable or unfeasible. The Position Manager valuations for mutual funds are based on end-of-day updates from CSI, as intraday valuations are not available for these.